Leave the laptop at home. Now you can use your Palm to do your typing anywhere! The same size as your Palm, the Half Keyboard allows you to type with just the Left Hand, leaving your other hand free for other things. The Half Keyboard is also great for desktop computer applications! With the Half Ergonomic Keyboard under one hand and your mouse, trackball, or stylus in the other, there's no need to go back and forth between your input devices when working on CAD, desktop publishing, animation, image manipulation, spreadsheets, or even gaming. The Half Keyboard is extremely comfortable. That's because the keys are full-sized. 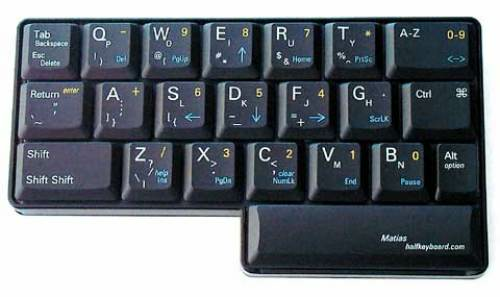 They have the same dimensions and travel as a real keyboard, so you feel like you're typing at the desktop. The only difference is that you're doing it with just one hand. Available for Palm m100, m105, III, V, VII Series, Handspring Visor, Deluxe, Platinum, Prism, Neo, Visor Pro, IBM WorkPad c3, HandEra, TRGpro, PC (Windows and Linux), and Macintosh (USB).